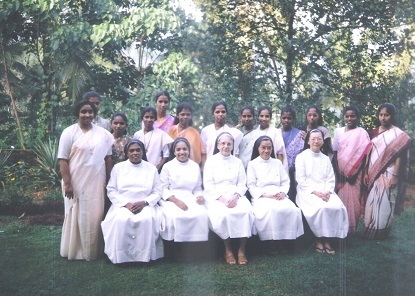 After much prayer, study and discerning about beginning a ministry in India, the Missionary Benedictine Sisters of Tutzing responded to the invitation of the Most Reverend Bishop Mathias Kappil of the mission diocese of Punalur, Kerala, a recently formed rural diocese from the coastal city of Kollam. On November 9, 1996, Mother Edeltrud Weist, Sr. Cecille Ido, and Sr. Lioba Yang arrived from Rome. At the same time arriving at the Trivandrum International Airport from the Philippines was Sr. Leoni Joseph Manimala who had just completed an integration experience. 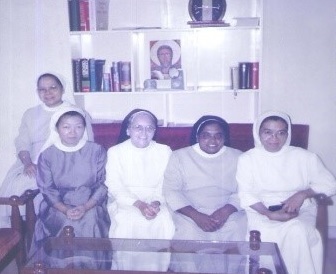 A short time later, Sr. Veronica Origines, who was in Rajkot, Gujarat State since 1995 as an instructor at the Jonas Institute of Nursing, would join the group to form the founding community in Vilakkudy. They were welcomed by Bishop Mathias Kappil, the first Bishop of this rural diocese formed in 1985. He brought them to the parochial house in Vilakkudy. This was a small house with four bedrooms, a small room for the chapel, a kitchen and washing areas. 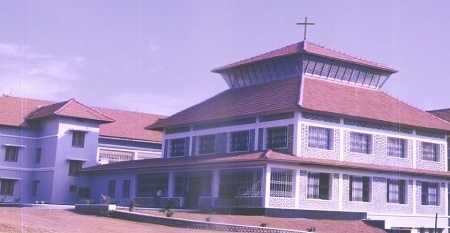 It would become the "entry point" for other congregations, too, who desired to serve in this rural Punalur Diocese dedicated to St. Therese of the Child Jesus. Since the Diocesan minor seminary was on the same property, the Sisters had daily Holy Mass with the young seminarians. The foreign sisters needed to exit the country at frequent intervals to renew their visas. It created an extra challenge for the small group. Yet, as a foreign congregation, girls started to inquire and ask to enter. After visiting their families, already in 1997, six girls joined the Sisters in the small house. The aspirancy had begun. In the next years, more young girls were taken in, guided in their faith life and taught English while they attended the local high school to complete the two-year program of formal education. Mother Edeltrud Weist, the first Superior, always was busy soliciting funds for the daily needs of the growing community, the education of the aspirants, a suitable land property, as well as the construction of a stable monastery. At the same time she remained a strong influence in the formation of new members as Missionary Benedictine Sisters. A permanent location for a suitable convent and land was found on a recently planted rubber tree plantation near the town of Punalur some 8 kilometers from Vilakudy. The monastery was constructed on one of the knolls in this mountainous region of Kerala. The winding road that had to be built leading to the top of the knoll reminded the pioneers of the road to Monte Casino. So, in their many walks and rides on the winding way up and down, the sisters affectionately referred to the knoll as "Benedictine Hill". By January 2000, Shanti Nivas Monastery was blessed. One year later the chapel was dedicated. Cardinal Joachim Meisner of Koln Diocese, Germany, a significant benefactor, among other generous supporters from abroad, blessed the new edifice. The first profession in the new monastery was in December 2002. Since then, the community has grown to include 14 professed Indian Sisters and 3-4 foreign Sisters who live the common monastic life with the Liturgy of the Hours prayed in English. St. Benedict Nursery School was opened in June 2000 upon the request of neighboring parents. Each year the number of students grew, until in 2004 the Lower Primary School (Standards I to IV) took on an official status. In the first 10 years the classes were always accommodated in the basement of Shanti Nivas convent in 4-5 small basement rooms, plus 2-3 other classes in the big hall, and at times outdoors under the trees. 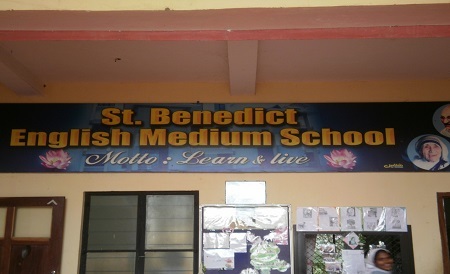 Already several batches of Standard IV students needed to transfer to other Upper Primary schools to continue on to Standard V. But parents desired that their children continue at St. Benedict English Medium School. By January 2010, a spacious 3-story school building at the far end of the property was completed and dedicated. Each year following, Standards Five, Six and Seven were added, the levels allowed according to government regulations. The current enrollment remains around 200 students with the majority of them of Hindu tradition. 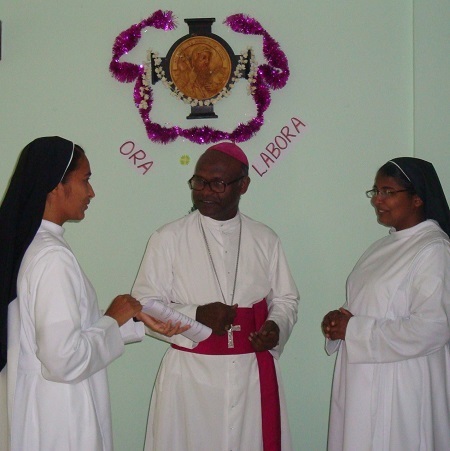 Other ministries of the Sisters of Shanti Nivas community are associated with the Cathedral Parish. The Sisters assist with the catechetical programs, help in diocesan initiatives for faith development, visit the sick and elderly parishioners and neighbors, and continue vocation promotion activities beyond the Diocese. 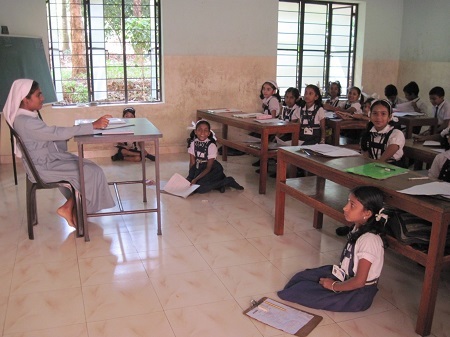 A valued supporter to the early development of the community in India was Oblate Isabella Mary Thennapilly (died May 23, 2015), who bridged contacts and candidates of the Syro-Malabar and Latin Catholic rites, aided in the community outreach in Rajkot in Gujarat State, and who modeled great dedication to the poor, the sick and the health care ministry, especially in the area of Rajkot. Visa problems for foreign sisters and limited personnel prevented development of the Jonas Institute outreach at Rajkot.